A woman in a male-dominated business is not a unique situation, but an American woman in the very closed world of French horseracing is certainly a more unusual proposition. I met with the racehorse trainer Gina Rarick who gave me an insight into both the sport and how she has managed to find her place in this business. Where does Paris begin and end? My vision of the city takes it out beyond the concrete ring-road into greener suburbs, and indeed it seems that you do not need to go far to find stables and racetracks. It’s just a 20 minute train ride out to Maisons-Lafitte where Gina Rarick is based, and once you pass the skyscrapers of La Defence and cross the river Seine twice, you find yourself in what today looks like a pleasant country town. Maisons-Laffitte is famous for its chateau, and most of the stables are now situated in what was previously the hunting forests of this large old house. I arrive on a bright Saturday morning and a whiff of crisp Autumn hangs in the air. The leaves on the trees are turning a ruddy orange but are still clinging on to their branches, and I pull up my collar and cross to the sunny side of the street. 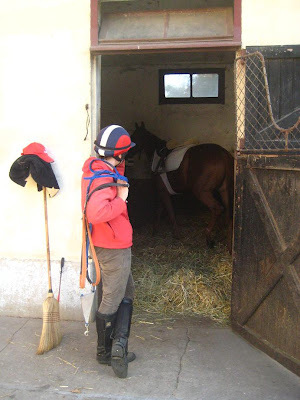 After a 15 minute walk I arrive at the stables and feel as if I am hundreds of kilometers from Paris. The stables are an attractive collection of buildings from the 1920s built around the owner’s house. Rarick rents some units here and is ready to welcome me when I arrive. I immediately see that she is a ball of determined energy, with a passion for her job that is often apparent in those who have made radical mid-life switches. “I’ve always loved horses” she tells me, “even if I was actually brought up on a dairy farm in Wisconsin”. From these small town origins she moved to Chicago where she became a journalist, working first for Knight Ridder then for the International Herald Tribune. Her specialty was the commodities markets, but it was far from being her passion. She began taking horse riding lessons in her spare time, and when an opportunity came up to transfer to Paris, she jumped at the opportunity. She continued working for the IHT, and used horses as a means to integrate into French society. She joined a club and began competing at show jumping meetings (“against 10 year olds” she points out), and slowly managed to get her newspaper to accept articles on horseracing. With these commissions she was able to travel to the top meetings around the world (the Grand National, the Kentucky Derby, the Hong Kong Derby) and meet many people in the industry. It grew to become an obsession and soon she was sucked into the world of jockeying and horse ownership. Finally, there came two turning points. 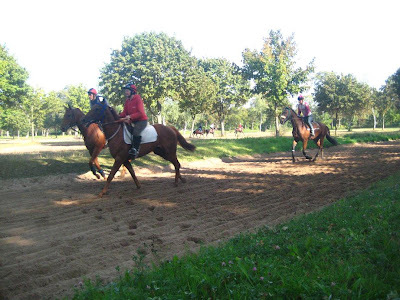 Firstly, to her great surprise she competed in and won a journalists’ horse race at Saint Cloud near Paris, and secondly the IHT began feeling the effects of the economic downturn and began offering attractive redundancy packages. Rarick knew that it was a ‘now or never’ moment, took the money and decided to set herself up as a qualified racehorse trainer. On September the 1st 2008 she became the first American woman to receive the necessary qualifications to train and race horses in France. “It’s been a really exciting adventure” she tells me on this day a little over one year later. “I now train seven horses, and although ideally I would like to increase that number to a maximum of fourteen or fifteen, I believe I have made the right choice by becoming a boutique yard”. Generally she has had to scrape around the lower levels of the horse sales, mostly in the UK, using her sense of feeling to make intelligent purchases, and as yet she has made few mistakes. “All my horses have either won or been in the money” she tells me. Indeed, when she tells me how the system operates in France, I’m tempted to invest myself! “It really is the best country in the world to be a racehorse owner” she tells me. Prize money is high, and because bookmakers are kept away from the sport, all the money generated by the state run PMU system is channeled back into the sport. “It costs around 2-3000 Euros to buy a horse” she explains, “and perhaps 20000 Euros to keep it in stables and have it trained. If your horse wins just two races in that year though you’ve covered your investment”. Rarick owns some of the horses herself, whilst others are leased to external owners (mostly ex-pats). “If you want to get into the game slowly, you can just lease one leg and pay 25% of the fees”. Watching her as she carefully bandages up the leg of one of the horses, I’m sure that the limb would be in good hands. Rarick is very modest about her role as a trainer. “The ratio for producing a successful runner is 40% breeding, 40% care and just 20% training” she explains. “In fact, the worst thing you can do is to over-train them and tire them out. You just have to keep them fresh, good and happy”. Rarick lives over the street from her horses, and can spot new scratches or bumps in seconds. After preparing thier lunch (including a can of Guiness for one of the horses! ), she gives them all the once over, stroking them and talking to them softly as she does so. Clearly she loves her job and the beasts she looks after. What is the downside of the game in France then? Rarick considers for a second then gives her opinion. “It was difficult to be accepted at first. Sure I’m a woman, and there are some jockeys who have a problem with that, but I’m also an American. The game is different in the States, where a form of doping is seen as fair and legal, and people here kind of assumed that I work in the same way. I have no experience as a trainer in the US though, and I’m completely anti-medication”. However, as opposed to the UK, there is no elitist element to the sport, and winning on the track has helped her to become accepted. "You should come and check out a race meeting one day" she suggests. It's a deal. The next time she has a runner on a weekend in the Paris region I'll be there. I'll even have cash ready to back her horse whatever the odds are. Gina Rarick seems like a winner to me. Note: There's plenty more to write about on this topic. I'll report back after attending the race meeting! 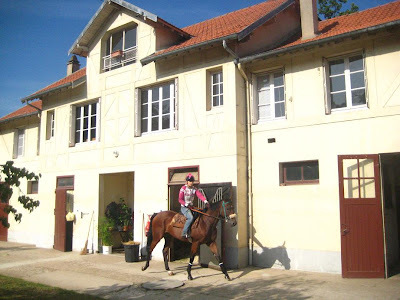 Gallopfrance: If you are interested in investing in a race horse or just interested in the sport, be sure to check out Gina Rarick's website. She also runs a very interesting and informative blog. I am fortunate to have a leased share in a horse trained by Gina Rarick - Hard Way, who won the 6th race this past Saturday at Craon. 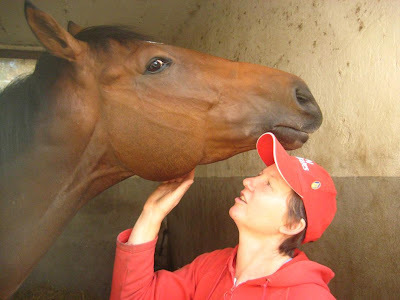 One would be hard pressed to find a better trainer of horses in France and Mme Rarick is just at the beginning of her career. I am very happy that you got out to meet her. I look forward to meeting you one day at the races. Tu as bien raconté le parcours de cette femme et la rencontre d'un point de vue si romantique. J'ai fait une rencontre moi aussi avec un homme qui rénove des meubles ; en même temps il est passionné par tant d'autres domaines. do horses get TMG I wonder? Mark: Thanks for 'introducing' me to Gina, and congratulations for the win! Cergie: Je pense que parfois il est difficile de melanger travail et passion, mais quand ça marche, ça doit être l'idéal. Peter: I think we always have to be ready and open for opportunities! Ken: I'm not sure what TMG is. Perhaps someone else could provide the answer! Good to see Gina on your blog. Shes really great, im currently looking into getting a horse with her. SP - I only interview the most interesting people on this blog! Yes, Gina is a really inspiring person. If I had the money, I'd get a horse with her too!